Plastic vacuum forming | INTERNATIONAL METAL PLAST spol. s r.o. IMP uses automatic CNC vacuum forming machines with optional milling in order to produce plastic parts with dimensions of up to 2050 x 1550 mm. The company processes ABS, HDPE, HIPS, PET-A, PET-G, PP, PS-ESD materials. The colors, patterns, UV stabilization and antistatic properties (ESD) are modified according to the customer’s requirements and the thicknesses range from 0.4 to 12 mm. IMP offers a wide range of services ranging from drafts to prototypes and on to mass production of all the products which can be fabricated using vacuum molding technology. 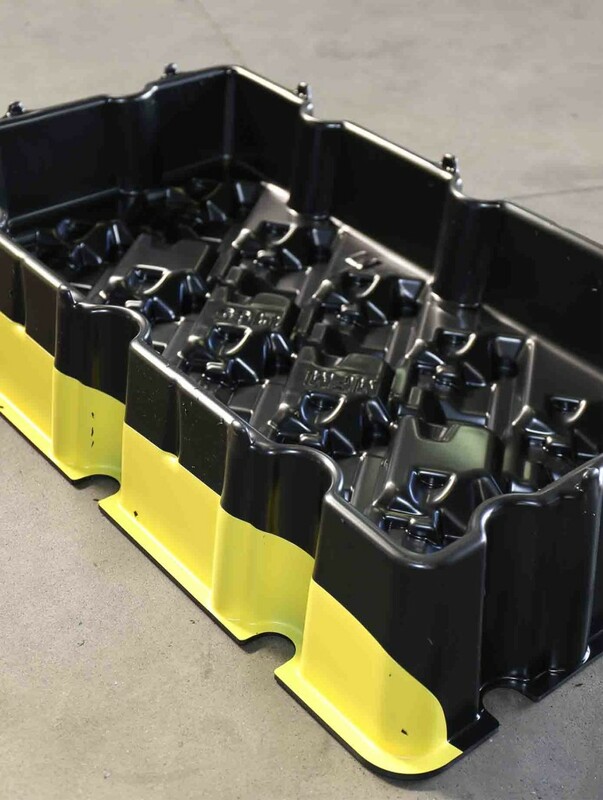 The main focus is on the development and production of custom-made plastic trays mainly for the automotive industry and its sub-contractors. These trays can be self-bearing or designed to be inserted in any other transport system. IMP also produces plastic pallets, covers and parts for solar panels. IMP further offers its customers the production of visible parts such as covers for tractors or bonnets for vehicles.